Wrist watches are naturally quite useful for their intended functions, as we watch-nerds know, especially when you can see them. When it comes to low (or no) light conditions, however, they can get tricky to read. The problem of legibility goes back as far as the history of the wristwatch itself and as technology has evolved, so has the legibility of our watches. A variety of materials and chemicals have been used over the years to bring luminescence, or lume, to wrist watches, with the first solutions coming in the early 1900’s. The early practice of applying lume to wrist watches, around the time of World War I, involved mixing the radioactive material radium with zinc sulfide. Radium had been known since it’s discovery in the late 1800’s and alone in proper doses it has some luminescent properties glowing blue. However the glow of radium alone was not bright enough and the amount required to make it useful would emit too much harmful radiation. Combining radium with zinc sulfide fixed the lume and radiation problems: the radioactive properties of the radium triggered the phosphor in the zinc sulfide causing the material to lume and the amount of radium needed was not harmful to the wearer. The zinc sulfide could be mixed with other compounds to vary the color of the luminescent material. With the radioactivity of the radium and the phosphorescent property of the zinc sulfide watches using this lume were “self-luminescent” as they could glow all by themselves without any need for a trigger. While the amount of radiation from the radium was low enough to not affect the wearer of the watch, it did have an impact upon those applying the material to the dial and hands. The process was normally done by women who would lick their paint brushes to get the point fine enough to paint the small markers and hands of the dial (as well as painting their fingernails and putting radium in their hair). As a result they swallowed radium which over time lead to a variety of illnesses and some even died as a result of the ingestion. The women were told the material was harmless so they thought nothing of their actions. A lawsuit was filed on behalf of these workers in 1927 and by the time it actually went to trial, many were too sick to attend. The case was ruled in favor of the Radium Girls and lead to revised occupational and health laws as a result. If you are interested in reading more, “Undark and the Radium Girls” by Alan Bellows is an excellent article. Throughout the years the unhealthy aspects of radium became more well known the amount used in watches was reduced gradually to the point a watch in the 1960’s had 1/100th the radium as from the early 1900’s. In 1968 the use of Radium in wrist watches was banned requiring alternative methods of lume to be used. Tritium became the material of choice. Tritium was activated via the same method as radium: a radioactive material mixed with zinc sulfide. The difference between radium and tritium is the level of radiation and half-life of the materials. The measure of radiation (denoted by it’s “relative biological effectiveness”) in radium is at the top of the scale with a 20 while tritium is at the other end with a ranking of 1, or about that of getting an x-ray. Meanwhile, the half-life of radium is 1,600 + years, meaning in that time the radium will be half as effect and again half in another 1,600; for tritium the half-life is twelve years. That means that many watches from the 1960’s will rarely have any lume left to see. While the material ages the color fades producing some very nice patina that is quite desirable on older watches. Although tritium is less radioactive than radium there were still health concerns over the material during the 1960’s. As with radium in the 1920’s, the concerns lead to reform and regulations. Dials using tritium were labeled to show the material was present, typically with “T” or “TT” or “H3”, the symbol for tritium. 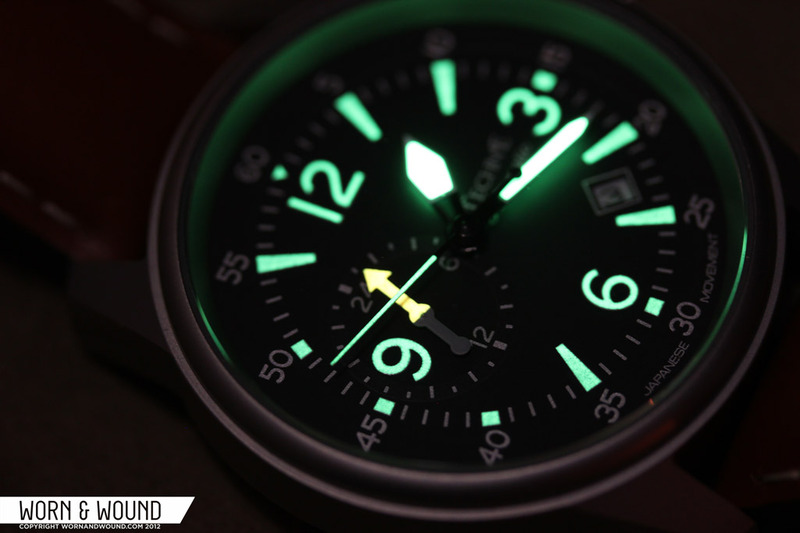 Although tritium paint is still used today for watch lume, it was most commonly used in the 1960’s through about the late 1990’s or early 2000’s. Also used during this time, however much more rarely, was promethium, another radioactive material used for self-luminous watch applications. The use of promethium is commonly denoted with “P” or “Pm” on the dial of the watch. All the while tritium was used watch manufactures continued to search for other alternatives outside of using a radioactive material to produce luminescence. This lead to using materials that were not self-illuminating, but rather those that needed an outside light source, photoluminescent materials. While radioluminescent materials active all the time photoluminescent materials need to be “charged” by a light source to activate the glowing properties. Immediately after charging a photoluminescent watch will normally be brighter than a radioluminescent watch but will fade with time after being charged. Meanwhile the luminescence of a tritium watch will remain constant throughout. At first the second compound in the radium and tritium lumes was used, zinc sulfide. It was found, however, that the lume provided faded much too quickly for any realistic application. In the late 1990s the use of tritium with zinc sulfide was mostly phased out in favor of a non-radioactive substance: LumiNova. LumiNova pigments were developed by the Japanese company Nemoto & Co. Ltd. in 1993;. later Neomoto & Co. joined with the Swiss company RC TRITEC Ltd. to form LumiNova AG Switzerland who distribute Super-LumiNova. Luminova and Super-LumiNova paints are in the photoluminscent category of lumes: they glow brightly after exposure to a light source and fade slowly over time. The pigments are not yet known to discolor with age and are very fragile and can be affected by humidity causing it to flake and crumble. Other companies use similar compounds, like Seiko’s Lumibrite, which maintains the same properties as Super-LumiNova. In recent years, tritium has made a comeback after in the form of tritium gas tubes. These small glass tubes contain a phosphor layer inside and are filled with tritium gas; these are known by gaseous tritium light source (GTLS). The tritium undergoes beta decay which releases electrons that trigger the phosphor layer causing it to glow. Tritium tubes are often applied to military watches as the luminesence will outlast that of Super-LumiNova, even though the LumiNova may glow brighter at the beginning of it’s charge. Ball Watch is perhaps the watch manufacturer best known for using tritium tubes in their watches. Others include Deep Blue, Android, Luminox, Reactor and Vostok Europe. While the materials and process for creating lume for watches has changed over the years the need and uses have remained. Whether diving, working at night or even just checking the time during a movie, your watch will have the luminance to see you through your task.